Obituaries won't be a regular feature of Silver Screen Surprises, but I couldn't resist writing about my all-time favorite TV dad. If you had a housekeeper and her dying wish was for you to take care of her kids, would you? Me neither. But Mr. Drummond did! 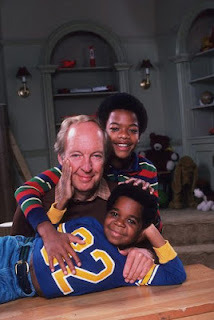 Indeed, Conrad Bain is best known for playing Philip Drummond from 1978 to 1986 on "Diff'rent Strokes." Most actors feel resentful when one film or TV show of theirs overshadows everything else they've ever done, but Bain seemed to have a good attitude about it. He even reprised the role of Mr. Drummond in a 1996 episode of "The Fresh Prince of Bel-Air." The concept of "Diff'rent Strokes" – a rich white millionaire takes in two orphaned black kids – was groundbreaking. To be sure, it was probably an implausible scenario for the 1970s – but the best films and TV shows have always presented the world we should live in, not the one we actually do. In any other actor's hands, this concept might have been doomed to failure. Bain, however, infused Mr. Drummond with just the right mixture of class, warmth, and love. Conrad Bain was also masterful at expressing righteous indignation, of which there was plenty to go around in retaliation to the startled reactions Mr. Drummond's unorthodox family received back in the late-'70s and early-'80s. The best example of this occurs very early on, in only the third episode of the show, "Mother's Last Visit." There, Mr. Drummond's mother (played with unrestrained bigotry by Irene Tedrow) cannot help but recoil at the sight of her son's two new children – his two new black children. By the end of the episode, Drummond puts the old racist biddy in her place and defends his newfound family's honor. Unfortunately, no article about "Diff'rent Strokes" can avoid mentioning the real-life problems its younger cast members suffered during and after the show's run. Okay, consider it mentioned. While most of Bain's work was in live theater and television (most notably, he played Dr. Arthur Harmon for six seasons on "Maude"), he also co-starred alongside Meryl Streep, Shirley MacLaine, and Dennis Quaid in the 1990 film "Postcards from the Edge." Bain's daughter Jennifer told TMZ that her father was "a lot like Mr. Drummond, but much more interesting." His TV son, Todd Bridges (who played Willis), considered him a "father figure" and said in an interview that they were "looking forward to celebrating his 90th birthday next month."